STOP HS2 | Secret Government Report says “Fundamentally Flawed” HS2 Could go 60% Over-Budget. A secret report produced by the Governments’ Infrastructure and Projects Authority months before HS2 got its’ final approval in Parliament, warned that the costs of the project were ”highly likely” to go over-budget and threaten public spending on other projects. The report, which has been leaked to the Sunday Times was produced in December 2016 whilst the HS2 Bill was still at committee stage in the House of Lords, states HS2 is “Highly likely to significantly overspend, c. 20-60%, with the likely cost increasing . . . to more than £80bn” with a “Very high opportunity-cost impact across other government departments”. The Sunday Times also states that the IPA report, which was classified “official-sensitive” and “not for publication” concluded that HS2 is “fundamentally flawed” and in a “precarious position”. The only other details from the report released at this time are that the management team at HS2 Ltd have a “Lack of cohesion and common vision” and have “No credible plan by which to gauge or manage progress”. Earlier this month, the IPA annual rated HS2 as ‘amber-red’ meaning the project is ‘in doubt’ with ‘major risks’, for the sixth year running. The leaking of this report comes a month after the cost of HS2 potentially went up by £3bn in the space of a week. In June, it was revealed that contractors had told HS2 Ltd that £6.6bn of construction contracts are likely to cost £1.2bn more, because HS2 Ltd have still not conducted detailed enough ground surveys. It has been confirmed that this means there will now not be finalised designs for Phase 1 until summer 2019, three years later than the schedule originally presented to Parliament. A couple of days after this, a whistle blower from HS2 Ltd came forward with documents suggesting that the cost of buying land for the project would cost around £1.9bn more than previously estimated, as HS2 Ltd had valued several thousand properties at nothing. Currently HS2 Ltd has come under heavy criticism for their policy of evicting business owners without any compensation whatsoever. It’s far worse, Grayling knew fully well when the HS2 Bill was going through the House of Lords that a Govt. estimate of the costs was £80bn. not the budget figure of £55.7bn. So it was withheld, deliberately. 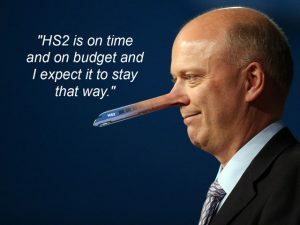 So, come on Grayling repeat that HS2 is on time and on budget. ‘Lies, damned lies and statistics’ – and now HS2. It’s all “Smoke and Mirrors”, HS2 and the Government have continuously treated our democracy with contempt. The Select Committee for the Phase 2a Bill appears to just ignore independent expert evidence. It seems that Higgins has abandoned the sinking ship. £Billions of taxpayers money has already been wasted but it has to stop NOW.